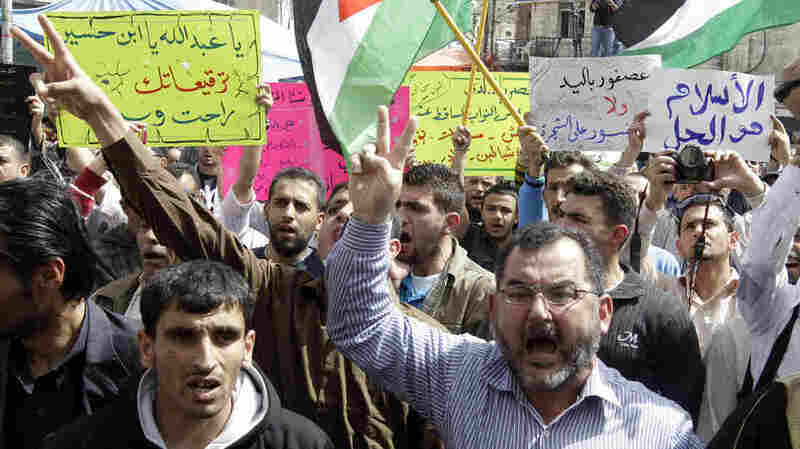 Jordanian protesters chant slogans against corruption during a March 15 anti-government demonstration in Amman. Jordanians have held Arab Spring-inspired protests since 2011, demanding political reforms and anti-corruption measures. The protests have been peaceful. Across the turbulent Middle East, Arab revolts have toppled dictators and strongmen. Jordan remains stable for now but the pressure is mounting. The Syrian war rages right next door, sending a flood of refugees across the border that has strained every resource in the kingdom. Jordan shares the region's troubles: a faltering economy; rampant unemployment, especially among the young; and a popular demand for a say in how the country is governed. "Jordan is stable, but you feel what is so unstable," says Labib Kamhawi, describing the contradictions. He is the head of the National Front for Reform, a coalition of political groups and civil society organizations. "The decision-making process is without any input from the people." Jordan didn't escape Arab Spring protests. When it started in January 2011, demonstrators had some of the same demands as Syria's protest movement next door. But Jordan was different. Protesters stopped short of calling for the downfall of King Abdullah, the boyish-looking monarch educated in the U.S. and Britain. 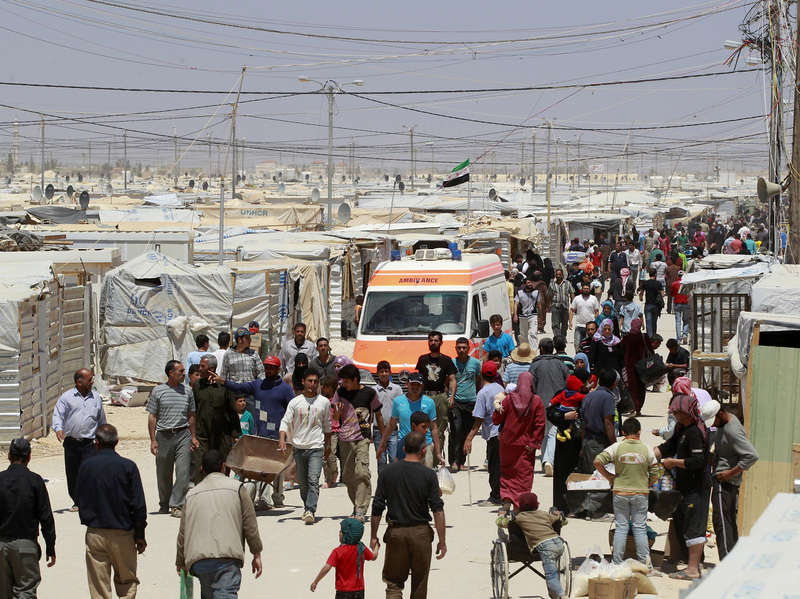 Syrian refugees at Zaatari refugee camp in the Jordanian city of Mafraq, near the border with Syria, on April 25. The massive influx of refugees fleeing fighting in neighboring Syria is straining the Jordanian system. And Jordan's security service was relatively restrained, handing out cold water and juice to protesters in a region where riot police regularly use clubs and guns to crush dissent. "Violence and blood spilling in the region led to catastrophes," observes Ali Shukri, a retired general and former adviser at the royal palace. The protest movement is smaller now, but the grievances have not gone away. High-level corruption is the biggest complaint, says Kamhawi. In the latest scandal, a relative of the king fled to London after a parliamentary investigation into corruption charges. He is just one more official skimming millions, complains Kamhawi, as Jordan survives on foreign aid. "People feel that this country is taken for a ride by a small group of people," Kamhawi says, and the economic ride for Jordanians is increasingly bumpy. Jordanians want a bigger say in how the country is run, says Kamhawi. There are elections, but the king can dissolve Parliament and can hire and fire the prime minister. The king has fired five prime ministers in the past three years. The government recently announced a dramatic rise in electricity prices, which could spark large protests again. But Jordan's political opposition remains fragmented, says Kamhawi. "There is no alternative to the king and the monarchy," he says. 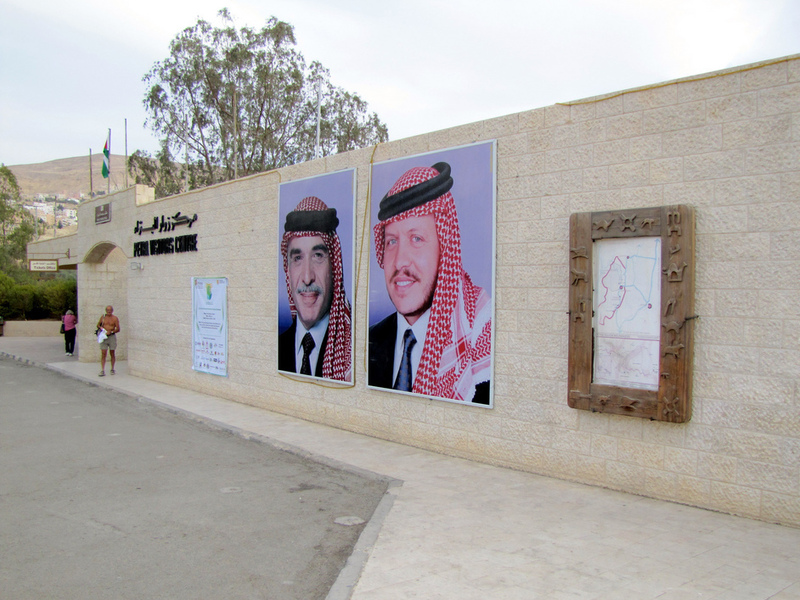 Jordan's King Abdullah, in the poster on the right, is shown next to his late father, King Hussein. Posters such as these reinforce the idea of continuity in a time of change. Stability trumps concerns over the economy these days. The tensions are clear in Mafraq, a dusty town 40 miles from the Syrian border. "We can hear daily, from midnight to 3 a.m., the constant barrage of bombings," says Amer al-Dughmi, who heads the tax office in Mafraq. "We even see the lights and the flashes from those explosions." Mafraq lives with Syria's war every day, swamped by rebels and refugees. The population there has more than doubled. As the town filled with Syrians, some Jordanians rented out their chicken coops and rooftops to refugees. International aid agencies picked up the inflated tab, complains the tax collector, driving prices out of reach for the locals. "You basically now have a total breakdown of the economic model that we had before," he says. Local marriages have been delayed because newlyweds can't find affordable housing. Refugees work longer hours for lower wages than the local residents. Merchants complain that refugees hurt local business by selling food and tents they get for free from international aid workers. Jordanians are convinced Syrians have crowded them out of the local hospital as the caseload has more than tripled in two years. At the local hospital, the administrator, Dr. Samir al-Mashakbey, points out that Jordan is one of the most "water poor" countries in the world. Jordanians are now complaining loudly, he says, because of the pressure on the system. Still, Jordanians are grateful that they have not suffered from the violence they see in Syria, Iraq and elsewhere in the region. Many Jordanians are now more hesitant to knock the Jordanian monarchy, says Ramzy Mardini, an analyst with the Jamestown Foundation. "I think Syria has been a gift in disguise for King Abdullah," he says. Mardini, based in Jordan, says regional violence and chaos have taken the steam out of Jordan's protest movement. "Do they want stability or democracy? It's made that choice very clear," he says. "I think it's actually made Abdullah more secure in his position rather than less secure." On billboards across Jordan, Abdullah's face beams down on his subjects. He is often pictured with his father, King Hussein, and his teenage son, a message of continuity in a chaotic time. At a dinner party in an upscale neighborhood in the hills outside Amman, the guests say that at least Jordan is safe. Naser Tahboub is the host for the meal. A professor, he is a member of the faculty at Jordan University's School of International Studies. The guests include some of his students, and his niece, May Tahboub, an architectural engineer. The discussion is all politics: Should Jordan intervene in Syria? The overwhelming consensus is to stay out. Then the discussion turns to Jordan's protest movement and demands for wider democracy. "It is definitely the case that the mood in Jordan has changed," declares Tahboub, the political science professor. His voice rises as he argues that Jordanians have lost confidence in a movement, he believes, that wants too much too soon. "Are those who are on the extreme, demonstrating, some of them at least, can they deliver, can they do a better job?" he asks his students. "There is a great deal of skepticism." Niece May speaks for a younger generation. She asks if Jordan can be stable, really safe, as long as Jordanians have no say in how the country is governed. But the threat from Syria and across other borders has changed even her calculations. "We backed up, not because we are against striking or talking out loud," she says. "We don't know what to do."